Sales targets and corresponding performance are easy to understand and analyse. Individual salespeople are given a number and timescale. If they meet or exceed that number in that period they are fine, if not questions are posed and adaptive measures taken. Their impact on the business is immediately clear. The more sold the greater the overall income. What about more complex metrics; such as skill/knowledge sets and gaps; for each employee in your organisation? How those gaps relate directly to the overall business performance? How much importance is attributed to each skill or knowledge set? The impact on overall business performance is not immediately clear and requires complex analysis to get it right. In other words, carrying out an employee and business SWOT analysis and aligning the two. The fundamental element herein includes data. Large volumes of data. Innovative solutions provide the ability to gather vital data on individuals as they perform day-to-day tasks in a set of simulations. This data can be aggregated for overall analysis, split for development identification, used in comparison against overall business objectives and of course, sent to any stakeholders as required. Make it challenging and fun. Using gamification techniques (think about flight simulators). Our Simulations have an intuitive look and feel. The step-by-step directions guide participants through the tasks they need to complete at each stage. Everything they need to know is at their fingertips, including a complete online manual written by Professors and Business experts. Our simulation system automatically prepares full feedback, results and reports. These are designed specifically to help recognise performance and also to evaluate the quality of participants business decisions. The simulations adopt a Balanced Scorecard approach to evaluate business performance. The overall score is based upon the team’s ability to satisfy customers, generate profits, invest in the future, motivate employees, and create wealth for stockholders. The Balanced Scorecard also helps identify participants’ strengths and weaknesses and compare them across the teams. The personal benefits: A true picture of their current understanding and skill set as well as a roadmap of their future. The HR department benefits: A true picture of existing skill sets, gaps and training development requirements. Future leaders can be easily identified. 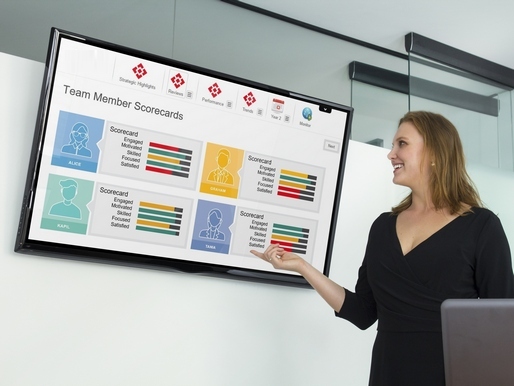 The business benefits: Employee metrics can be matched to business objectives, personal/company growth areas aligned, employees engaged through gamification techniques. The story goes on…. scalable facilitation (who where when how) is just one of many other topics. If you found this article interesting and would like to discuss gathering employee performance data, conducting personal and company SWOT analysis to align training needs and optimise your business growth strategies, contact us here or call us today on 0845 371 3088 to discuss how easily this can work in your business.